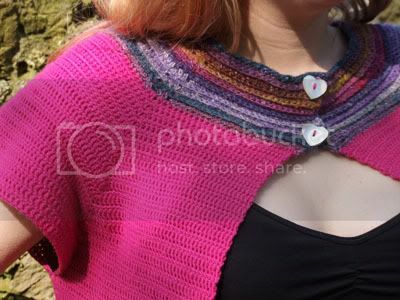 A free crochet pattern from Aoibhe Ni. Find it on Ravelry here. 2 cute buttons, approx 1.5cm in diameter. Pattern written for bust sizes: 32" (34"/36"/38"/40"/42"), and is written in UK stitch language. For a handy translation sheet for US stitch names, please click here. Turning chains (2ch) counts as 1st tr st. 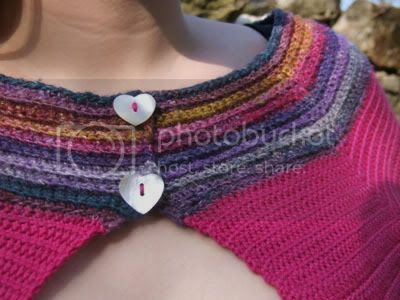 Follow the pattern as written to add buttonholes. 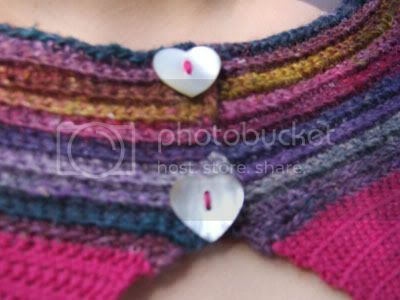 Once you are ready to add buttons to top, just sew them through both layers of collar fabric as if there was a buttonhole. You won't be a ble to “unbutton”, but it's a handy way of avoiding frogging what you've made if you do forget to add holes along the way! Row 23. dc230 (233/236/239/245/248), ch2 & turn. Row 27. dc254 (257/260/263/269/272), ch2 & turn. Row 31. dc278 (281/284/287/293/296), ch2 & turn. Row 35. dc302 (305/308/311320), ch2 & turn. Row 39. dc326 (329/332/335/341/344), ch2 & turn. Row 43. dc350 (353/356/359/365/368), ch2 & turn. Row 47. dc374 (377/380/383/389/392), ch2 & turn. Rows 54-91. Rep Rows 52-53, ending on a tr row. Row 92-93. rep Rows 52-53, ending on a tr row. Row 94-95. rep Rows 52-53, ending on a tr row. Bind off, weave in ends and block gently. 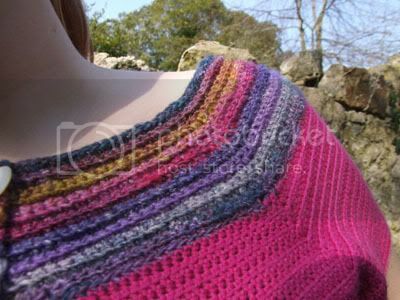 Blocking is the process whereby yarn used in a project is made to relax and better take the shape of the project. It will often greatly improve the drape and fit of a garment, and enhance the appearance of lacy pieces. This can be completed in a few different ways. For this project I choce to block using the submersion technique. 1. Fill a sink with cold water and gently easy garment into the water. 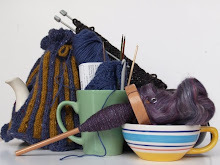 Do not scrub, wring or stretch your crochet; just push down on it to get all the air bubbles out and to make sure the yarn is thoroughly saturated. 2. Holding onto the crochet, pull the plug and allow water to drain. 3. Carefully squeeze excess watre out of crochet, being careful not to wring or stretch. It needn't be totally water-free after thsi step. 4. Lay a towel out and place crochet on top of it. Roll crochet up into towel, like a giant swiss roll (nom nom). 5. Stand on towel to press water out of crochet. 6. Unroll towel and lie crochet out on a flat surface to dry. This may seem superfluous, but it will cure crochet's annoying tendency to curl at the corners, and will make sure the sleeves and body drape better. Thanks for reading my pattern. I hope you enjoy it! OMG, this is exactly wot I was looking for! Thank you for making it free!!! Ur so awesome! Is this on Ravelry yet? Cos I want to queue it!